You're right, lamb chops with perfectly seasoned broiled potatoes seem like a meal to drive mid-week blues away, will be trying this one out soon! Wow..beautiful..Looks like I have to make them soon or else I will keep coming to your blog to look at those pictures :). Nice recipe Manisha. Is that the lamb chops showing up in the picture next to the potatoes? 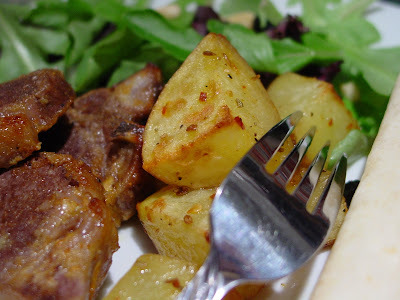 Looks too good!I normally make a salad with lamb chops, but next time will surely try these potatos. potatoes over ice cream, for us as well. Those reds must smell real good. Saundhi khushbu ie smell that attracts. Manisha I'm so happy you blog and answer the comments too just like me ;). Three cheers to Annites! Potatoes look beautiful, Manisha. I am trying to teach my daughter that "touch-feel-replace-on-shelf" idea too ;) Glad to see you back! Potatoes look perfectly cubed and garnished with spices. Lovely presentation. Wld definitely give it a go this weekend. Anita, what, regular rotis? After those bagels you made, I thought roomali roti would be a breeze ;-) The roomali rotis weren't bad at all. They were square and not quite as roomali but I'm not complaining. I haven't had a roomali roti or a pretender for the last 5 years! Monisha, thanks to Gini, I'm hooked. I hope you like it, too! Shilpa, try the lamb chops, too. You're eating chicken again, now try lamb! Sig, yup, those are lamb chops along with salad and a roti. We don't always have roti but salad is always included. The salad I make is a variation of this spring salad. I add dried blueberries - which aren't really dried blueberries as they have corn syrup in them (drat!). bee, I always thought we were abnormal. Nice to know we have company! Anjali, that was some discovery, eh? I have wonderful memories even though I was at Anne's for a little less than 3 years! As for replying to comments, to each his own. If I posted several times a week and had a really busy blog, I might do things differently. As you can see - I get to comments almost a day or two later! :-D But I love the interaction and have made some really wonderful friends. Linda, every time we'd go into the stores and she'd want every toy she saw, I'd fill the cart with toys and just before we checked out, we'd go and put them back. Why? That was where the toys lived, see! They'd miss their home when it got dark. It worked every time. She knows better now, of course! Now I have to use different strategies! Sanjana, I wonder if you know that those links are useless unless someone is registered with your forums and signed in. So maybe you need to revisit your marketing strategy for your forums. For now, I would appreciate it if you didn't link-drop in the comments on my blog as those links clutter my blog and are quite useless to me and my readers because of the way your forums are set up. FWIW, I did sign up at your forums. There is a wealth of information in some really wonderful posts. But what you're doing is beginning to get a bit annoying. A suggestion for you would be: instead of using your Blogger profile to comment - which incidentally is equally useless as your profile is private - consider using the option 'Other' and include the link you wish to drop in the field 'Your Web Page'. That way you get what you want - eyeballs - for your registration/signin page. You will get what you want and I will get what I want. Since I can't edit comments, please note that I may delete your comments from my blog without any explanation in the future - especially if the link is long and messes with my template. Let's hope you return to read this! Potatoes look delicious. I haven't made those in a while. Australian lamb chops always end up in our shopping cart whenever we are at Costco. Haven't had roomali roti in years. Will pick some up today while at the grocery store. Looks yummy manisha. I am waiting for a picture and recipe of the lamb chops. hey manisha , gud blog , gud reciepes , i just started blogging since last few days. I have also linked u to my blog Lazzat. The potatoes do look delicious, but the first pic of the whole masalas with the red flecks is awesome. HKG, it's simple and very flavorful. I like to cut down on my time in the kitchen during weeknights and this works very well! Gini, I couldn't believe you don't like potatoes! Especially considering how you had me hooked! We have moved this to a biweekly meal since it became too much meat too often for my husband. Deepz, I will post the recipe for lamb chops soon! I have several deadlines this week and I am trying to meet them all. I use a very simple recipe and it's very hard to mess up. Glad to have you back! Congrats on your wedding once again! RP, nigella seeds are a great change. I make my own panch phoran - instead of the ready-mix - with it and use it in veggies all the time. Try these potatoes first - only because they are so easy to make! 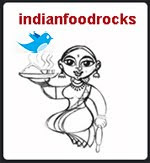 Rahin, welcome to IFR and to the blogging world. Looking forward to some gems from you soon! Sandeepa, I like that look, too! I, almost, don't want to put it in the oven because the colors get toned down as it cooks. yummy recipe...my husband makes these with an Italian blend of his on Pasta nights...I like your desi twists in this. Roomali...I should probably try it. I might have, the memory blurs..did I upturn the karahi to make it?? But what i want to write about is Sanjana...I never see thru these ploys because I never seem to know when someone is visiting for selfish reasons...how the system works. Italian blend? Trupti, please share the recipe! Or have him do another guest post! Anita, I've never made roomali roti so if you figure it out, I'll follow! The Indusladies forums are full of information and have several very helpful members. However, after a few comments on my blog, it was obvious that she was here for the linkdrop more than anything else. I haven't checked again but the links she dropped went to a registration page instead of a page or a post to related recipes. I certainly don't mind if there are links that lead to more recipes and discussions but her links were dead-ends. And consistently. So it got a bit annoying. If the links were useful, I'm all for sharing more information! I believe Indusladies is also conducting an advertising campaign, which is a much better way of advertising their existence than these semi-spammy linkdrops in comments on blogs. Hopefully, whoever is carrying out their 'viral' campaign will read this and rethink that strategy! And I've enabled comments on the latest post. I am not sure how that happened! Comment away! Sorry about that! Potatoes with indian spices are always wonderful( I may even add some saffron and dried rose to the spice blend). I broil mine and have them with some Imli Chutney. They are amazing.